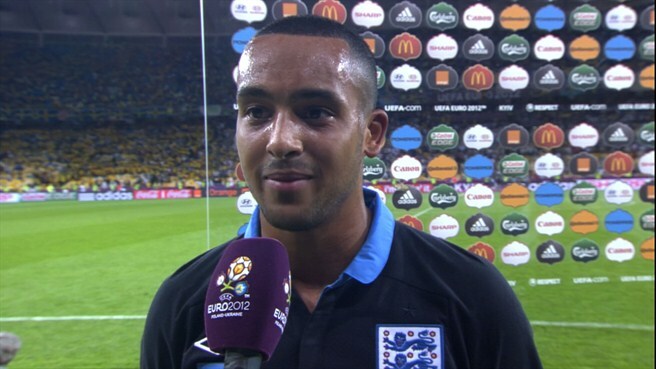 Theo Walcott came on as sub for England against Sweden and according to stats I saw, played for 32 minutes, was on the ball for 11 seconds, made four passes, all successful, had one assist and one goal. (11 seconds and four passes doesn’t sound much, so I’m not vouching for the accuracy of that.) Twitter then exploded with Arsenal fans sticking a metaphorical two fingers up to everyone who ever doubted young Mr Walcott’s talent, workrate, football brain and everything else. Right. So 32 minutes is enough to prove everything to everyone. Looking a bit more objectively, 32 minutes in isolation doesn’t really tell anyone anything. It’s a small piece of the jigsaw of Theo’s career so far. And it’s already a thousand-piece jigsaw. Maybe if Theo had kept the ball himself for the whole 32 minutes rather than 11 seconds of it, it would tell us more, but he didn’t. “But what about the goal and the assist?” An ‘assist’ remains the most stupid concept in football stats. Why is the last pass more important than any of the ones before? It’s not. The goal wouldn’t have been scored if you removed any of the passes from the sequence that preceded it. All were equally important. Suppose for England’s first goal Gerrard crossed, Carroll headed down and Young was there for a one yard tap-in. Young gets a goal, Carroll gets an assist instead of a goal and Gerrard, although he would have done exactly the same as before, is removed from the list of credits. It’s ridiculous. The assist is a stupid concept partly because, like 99 per cent of football stats, it takes no account of whether the pass played was the best option at the time and partly because it’s a team game (which players like Theo always come out and say in post-match interviews so as not to sound boastful, but it’s actually true). In the case of Theo’s assist, it nearly wasn’t one anyway because he put it a yard behind where it should have been, leaving Welbeck to improvise and drag the ball backwards through his own legs in order to score. Welbeck should probably be awarded both the goal and the assist. For Theo’s goal, he took a speculative shot from outside the box that went in past an unsighted and off-balance keeper. Theo’s own reaction showed that he didn’t really believe himself that it should have gone in. He was almost embarrassed. Compare that with Eric Cantona’s famous diagonal chip from the edge of the box into the top corner, when he then stood on the spot, arms aloft, imperious expression on his face, slowly rotating to take in the applause from the whole ground. Oh yes, he meant that one. Not that Theo didn’t meanto score. If you don’t buy a ticket, you don’t win the raffle. He took the shot, he wanted it to go in, fair play. But he and I both know that nine times out of ten, if not 99 out of 100, it wouldn’t have. The ball wouldn’t have moved like that, the keeper wouldn’t have been confused by both the movement and the crowd of players in front of him; easy save. But whatever; even if you want to accept that assists are priceless and goals doubly priceless and Theo did brilliantly for both, what does that tell us about the grand scheme of things? Frankly, bugger all. I am twice his age and I could have gone on there against a tiring team and made 4 passes, and struck a lucky one-in-a-thousand shot. I wouldn’t have that effect every week, but then again neither would Theo. I’ll grant you he’d do it a lot more often than I would, but it’s his lack of consistency that remains his biggest problem. Consistency is the one thing in a footballer that’s more important than talent. History is littered with the talented who should’ve done more with their careers. Some were lazy – the likes of Rodney Marsh and Alan Hudson from my youth – some had great expectations heaped upon them, and had a Dickens of a time living up to the hype – Peter Marinello, for example – some were great, but couldn’t stand the pressure – Gazza, George Best even – but most are in a different category: if they’re inconsistent they just end up playing at a lower level than their talent says they should. Lee Trundle of Swansea (and assorted other lower league clubs) is a good example of someone with outrageous talent who never made a real impact. But there are numerous others who don’t even get noticed, they just trundle along (sorry) in League 1 or 2, occasionally playing a brilliant 90 minutes, but usually misplacing more passes than the average Championship player and taking more wayward shots. In turn Championship players are less consistent than those in the Premier League, and internationals are more consistent than the average PL player. Some players are special, no doubt, but in terms of talent alone there isn’t much difference from one step to the next; it’s consistency that makes the difference. What of Theo? He’s a good Premier League player, helped by his speed, but is he consistent enough? Does he play like a good Premier League player every week, or does he sometimes play like an average Championship player? I’m sure I’ll get called a miserable so-and-so for this, but believe me, Theo knows as well as I do that he does, and also that 32 minutes is not that important in the context of a career. Bigger picture, people, bigger picture. “Give him the £100k a week that he wants.” Well I’ve no proof he wants it, but 32 minutes isn’t going to make me think he’s worth it anyway. “He’s put ten grand a week on his value tonight.” Maybe in the weaselling mind of his agent, no other sane person I’m sure. “Take that Waddle/Hansen/the world, ‘no football brain.’” Last night did nothing to prove that one way or the other. You’d have to be mad to think otherwise. “I said he was brilliant all along.” Except for all the times he isn’t. “He’s silenced all the doubters.” Unlikely. Theo is a personable and intelligent young man who presents himself with dignity and represents Arsenal off the field in the way I wish all players would. He is also no doubt getting more consistent. He played more good games last season than the season before; I hope he plays even more next season, if he’s still at Arsenal. He could yet end up a consistent top class international performer. But he’s not there yet, and 32 minutes doesn’t prove he is. This article proves what an imbecile you are. Walcott changed the game – that’s what TOP players do. He also put another ‘assist’ on a plate for Gerrard who blasted it at the keeper instead of leaving the tap-in for The Ox. And no – you couldn’t have gone on and done what Theo did, and the fact that you claim you could proves what a moronic individual you are. Please go away, you’ve embarrassed yourself enough. You don’t get it do you. Anyone can do things ONCE. Great players do it every week. That’s the point. As a one off any player from the Championship could have played the same game as Theo did last night. It doesn’t mean they would have done it last night, but they’ll probably do it once in their career. Theo has done it more than once, but last night in isolation proves nothing. 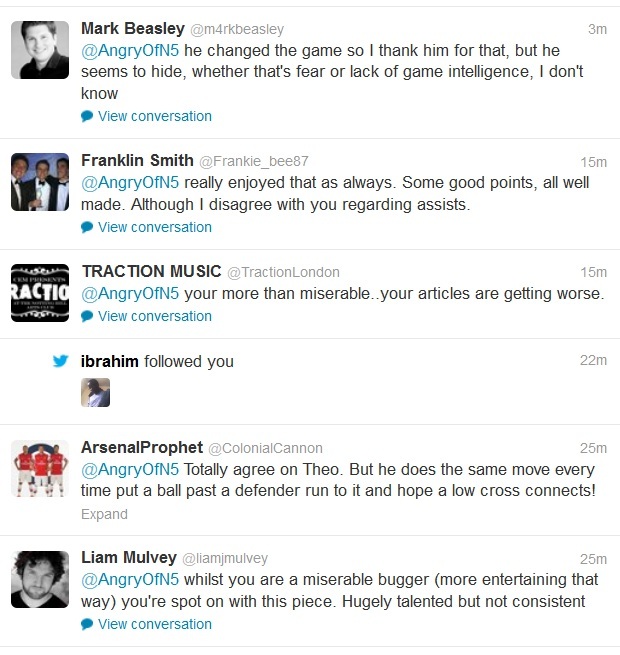 Remember that Theo never created the hype around him, the media did. I feel sorry for him, he tries hard every time he plays but expectations are so high. Even if you compare Walcott against other England players he has the best stats in the league apart from Rooney. He is the TOP English assist maker with 11. The 2nd best English player with combined assists&goals stats with 18 -Rooney was the top Englishman. Yes stats don’t tell the full story, but they do indicate a level of consistency over a season. When you look at the figures from Milner, Downing and co. you would have to agree that he deserves a starting place in the England team. just be happy he had an impact on the game? he won us the game? or is that too much to ask? i promise myself i’ll never read this blog again. Walcott is a liability, It’s only sagna playing behind him that hides his short comings, No positional sense can’t beat a player and piss poor at crossing, Look at his first goal against spurs he just stood there after scoring, didn’t know what todo. His not got Arsenal in his heart and will drop us for chelsea or city at the first chance. So I started off reading this article thinking that it was just another blogger,fan,or a neutral fan going on Walcott like the majority,but then I read the rest of the article and realized what you are pointing out. You make a very good point that just because he changed the game in 32min. it doesn’t mean hes a football good. He deserves credit for what he did but he needs to learn that on a consistent basis. I appreciate that you conclude by saying that he can be great if he can achieve consistency. He has potential but he needs to show it every time he plays. Interesting post, I like thoughts re. assists especially as they didn’t exist a few years ago as far as I remember. Re. Theo, he is irrecoverably stereotyped by Hansen’s comment – even the commentators for yesterdays game brought up footballing brains when he came on. End analysis, he’s only 23 and he’s done pretty well so far – he’s not the finished article but he may be one day. Or he might turn out to be another Jose Antonio Reyes. Footballing brain or invisible motorbike ? I bet you can’t even keep a footbal off the ground for five touches. You shouldn’t be chastising Theo cause he not that good in your opinion. At the end of the day he is at least top 10 english attackers right now. So if he’s crap I feel sorry for our beloved england because the previous and current managers obviously rate him. I removed the personal abuse from your post. You should be able to make your point without being childish. Inconsistent but capable of very good stuff. His consistency is improving. I would keep him; our other wide right options are not consistent yet. The Ox is still growing, Podolski may take time to adapt and is probably going to play on the left, Gervinho had a very inconsistent season, Miyaichi shows promise but like The Ox is still young, and Arshavin looks likely to be sold. Good on you for this article. Anyone who’s tracking Walcott’s development dispassionately will know deep down that there’s more to come from him. He’s not close to his potential yet, awesome as he can be. The term assist could do with refining too, as not all assists were created equal. And I’d give Welbeck a goal and half an assist for that play! The issue begins and ends, as you’re quite rightly saying, with the ‘C’ word. CONSISTENCY. That’s always Theo’s problem, whether a ‘game-of-two-halves’ or one good game followed by one poor game. We all love him when he delivers, but he delivers 50% only. If he wants 100k, then he should be offered 50k. To give you an extreme example of the absurdity of the assist statistic, consider Thierry Henry’s goal against Tottenham where he ran the length of the pitch leaving virtually all of the Tottenham team in his wake. That started with a simple pass to him deep inside the Arsenal half but whoever gave him the ball got “an assist” for their efforts. Ha, good point. Easiest assist ever.